Medicare Supplement Plan C is a popular Medicare Supplement Plan that pays most healthcare costs not covered by Original Medicare. After Original Medicare pays its portion of medical costs, beneficiaries are left with many out of pocket costs. Such as copayments, deductibles, con-insurance. In addition to the above out of pocket costs, Medicare Part B also leaves you responsible for 20% of your medical bill. That’s where Medicare Supplement Plan C steps in to help. Medicare Supplement Plan C is one of the most comprehensive Medicare Supplement Plans available. Supplement plans are also known as Medigap Plans. 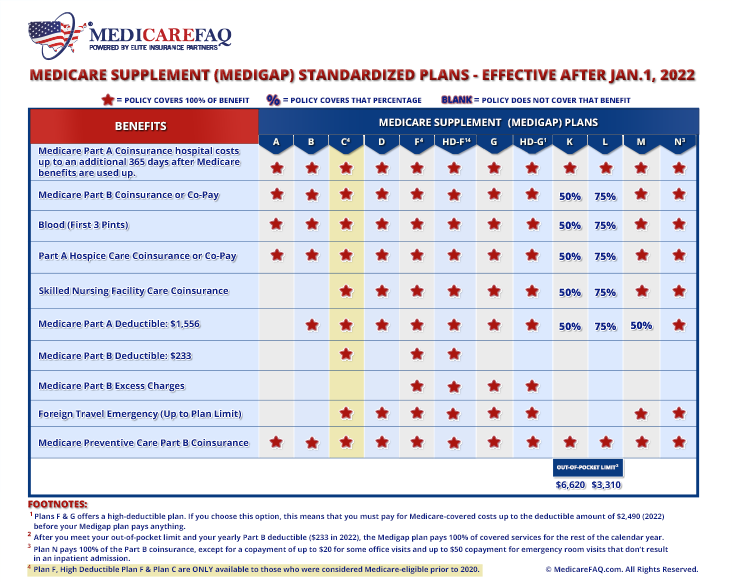 Medicare Supplement Plan C and Medigap Plan C are the same things. Medigap Plan C is often confused with Medicare Part C, also known as Medicare Advantage, but the two are very different. Medigap Plan C is supplemental insurance for people who are enrolled in Original Medicare. Medicare Part C is a private health insurance alternative to Original Medicare. If you have a Medicare Advantage Plan, you cannot enroll in a Medigap Plan. There are 3 Medigap Plans that fall under the category of first-dollar coverage plans, Plan C is one of them. All first-dollar coverage means is you pay nothing out of pocket. Any medical costs left up to the beneficiary to pay after Original Medicare pays their portion will be billed to your Medicare Supplement carrier. Thus, leaving you with zero out of pocket costs. The only benefit Medicare Supplement Plan C does not include is coverage for any excess charges that fall under Part B. Excess charges are costs that extend above the Medicare-approved amount for that service. A doctor or physician can charge up to an additional 15% over the Medicare-approved amount. They bill these excess charges directly to the beneficiary. However, not many doctors have excess charges. A quick phone call to your physician will let you know if they accept the Medicare-approved amount for their services. If you’re not concerned about excess charges, most Medicare beneficiaries are not, then Medicare Supplement Plan C will leave you with $0 out of pocket costs. Plan C, as well as all Medigap Plans, give you the option to choose any doctor. You can see a specialist at any time with no referral. In addition, they’re guaranteed renewable. You don’t have to worry about being canceled due to any health issues. Anyone who is enrolled in Medicare Part B is eligible. It’s easiest to qualify for coverage if you enroll during your six-month Open Enrollment Period. Your Medicare Supplement Open Enrollment Period begins as soon as your Part B is in effect. If you enroll during this time, you automatically qualify for a policy. A beneficiary can’t be rejected or forced to pay higher rates because of pre-existing health conditions. This is because you’re granted Guaranteed Issue. If your Open Enrollment Period has passed, your policy will be “medically underwritten.” This just means you’ll have to answer some health questions during the application process. However, you can enroll in Medicare Supplement Plan C at any time. Even if your one time Open Enrollment Period has come and gone. If you didn’t sign up for Part B because you still had employer health insurance when you turned 65, your six-month Open Enrollment Period will begin the month you sign up for Part B. If you’re disabled and under 65, eligibility will depend on the state where you live. Medicare Supplement Plan C is one of the most comprehensive supplement plans available. Since it includes almost all the benefit options, it’s one of the more costly plans. However, if you value peace of mind, then the benefits will outweigh the costs. Most Medicare beneficiaries don’t mind paying a little more to feel financially secure with it comes to their healthcare costs. For Medicare beneficiaries that don’t have a Medicare Supplement Plan, paying 20% out of pocket on a medical bill that could be thousands of dollars or more could financially ruin them. For example, let’s say you’re diagnosed with diabetes. After multiple visits to the doctors’ office for various tests, you find out you need diabetic supplies such as glucose monitors and test strips. Don’t forget insulin! You also need routine foot and eye exams. Lets’ say the total costs of all your doctors’ visits and various tests came to $20,000. Then the total costs of your diabetic supplies came to another $20,000. After Medicare pays their 80% of $40,000, you’re left with the remaining $8,000 to pay out of pocket. However, if you have Medicare Supplement Plan C, that $8,000 is covered. Let’s not forget coinsurance & co-pays for routine foot and eye exams. Any leftover costs from these will also be covered by Plan C.
Therefore, the only cost for Medicare Plan C is the monthly premium. You will pay a monthly premium for Plan C coverage. Your premium amount depends on where you live, the carrier you choose, your plan’s rate structure, your age, gender, etc. Regardless of the carrier you choose, the benefits will always remain the same. The only difference is the premium the carrier charges for the supplement plan. That’s why it’s important to have a licensed agent by your side when comparing rates. The average premium for Medicare Plan C is around $150 per month. Again, the premium varies based off of many factors. It could be less or more, depending on your location, age, etc. Just because your neighbor pays X premium for a supplement plan does not mean you’ll pay the same. Some have heard that first-dollar coverage plans are going to be discontinued in 2020. This is true, but there are important facts to know about this change. First-dollar coverage plans include Plan C, Plan F & High-Deductible Plan F. The plans are being discontinued due to beneficiaries going to the doctors more than necessary. Since they had no out of pocket costs, going for minor medical issues was no big deal. Well, it was apparently a big deal to Medicare. To reduce these unnecessary doctors visits, they wanted to make beneficiaries responsible for some out of pocket costs, even if it’s just the Part B deductible. The discontinuation of first-dollar coverage plans will only impact beneficiaries that become Medicare “eligible” after 2020. This means, as long as you turned 65 before 2020, you can still enroll in Medicare Plan C after 2020. For example, if you turned 65 sometime in August of 2019, but did not enroll in Part B until sometime in 2020, you can still enroll in one of the three first-dollar Medicare Supplement Plans. Therefore, regardless if you turned 65 in 1994, 2005 or 2019, you can still enroll in these plans after 2020. If you don’t want to enroll in Plan C for one reason or another, then Plan G is the best alternative. The only difference between Plan C and Plan G is coverage for your Part B Deductible. If you’re not eligible for Medicare until after 2020, but want similar benefits to first-dollar coverage plans, then Plan G is your best option. Plan G is not going anywhere in 2020 and on average costs a little less than Plan C.
We can provide you with rates for Medicare Supplement Plan C from the top-rated insurance companies in your area. We’ll answer your questions and help you complete the online enrollment process. Since Medicare is always changing, it’s important to have a licensed agent by your side. To get started, give us a call. Or, you can use our online rate comparison tool to see a side by side comparison of rates in your area now.